Keeping you up to date with your local community. The Isle of Bute is blessed with 57 miles of beaches and coastline, including: Ettrick Bay (above), with its safe, shallow bathing waters; Scalpsie, on the west, where seals can be spotted; the horseshoe of St Ninian's Bay, with its ruined chapel at the point; not to mention the views of the mainland from Ardbeg, only a mile from Rothesay. These beaches are part of Bute's natural wonder, enjoyed by over 7,000 locals and considerably more tourists. Unfortunately, one of the by-products of our modern life is the increase in marine litter, and the pollution of beautiful beaches by detritus. This is where organisations like Beachwatch Bute step in. Since 1998, Beachwatch Bute has been monitoring the condition of all our beaches and shoreline - not only those used by the public. They keep the beaches clean themselves, co-ordinate beach clean-ups with volunteers, and help to cultivate and care for our natural environment. They have worked with local primary schools, organisations and groups, all of whom wish to play a part in the guardianship of our coastline. Beachwatch Bute also organises an event each April to mark the Keep Scotland Tidy Spring Clean, and work closely with The GRAB Trust, the Marine Conservation Society, Scottish Strandings, SEPA, Scottish Natural Heritage, and many more. Beachwatch Bute records roughly 1700 bags of rubbish per year. In terms of weight, this equates to over 10 tonnes - and that doesn't include the larger objects, like refrigerators, that don't fit into black plastic bin liners. If you consider that the majority of items are light - like cotton wool buds and crisp packets - it's actually quite difficult to imagine the sheer volume of litter that accumulates. By far the most common items removed from the beach are plastics. Nobody really knows how long it takes for plastic to degrade, but it's estimated at between 450 and 1000 years - which is an awfully long time to be floating in the sea, dirtying a beach, or festering in a landfill. Wheels and tyres are commonly washed up, as are traffic cones, plastic pails and lobster creels. 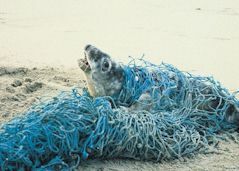 There are also more natural pollutants, such as dead porpoises and seals, which are unsightly (especially if rolled in by a beloved pet) but will at least biodegrade. As well as plastic items from ships, more worrying litter is to be found in the form of hypodermic syringes. These are bio-hazardous and need to be handled extremely carefully. 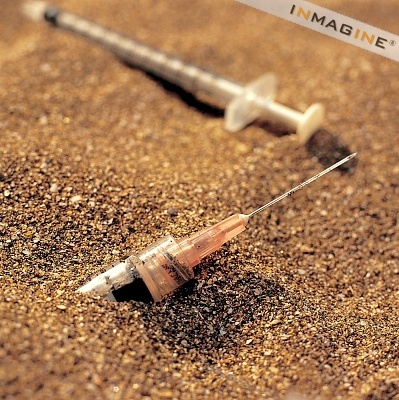 Leaving them on the beach is an extreme risk, as hypodermic needles can transmit serious diseases. Unfortunately, syringes are a widespread problem, not only found on Bute beaches but afflicting coastline around the country. 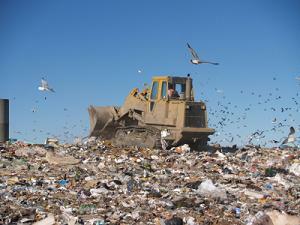 A vast amount of litter is also extremely dangerous to wildlife. Ettrick Bay is home to an RSPB hide, from which you can watch a wonderful array of different sea and land birds - but those same birds that can be witnessed flying with such grace above the sea and sand, are at great risk from careless littering. Fishing nets and lines pose a particular problem, as birds become trapped in the mesh, or swallow line and choke. Chewing gum seals beaks shut, little pieces of plastic are ingested, plastic beer-can rings cause strangulation - and not just for birds. Seals, porpoises, dolphins, basking sharks - all can find themselves at risk from marine litter. Regular beach cleans greatly reduce the negative effects of marine litter - and Beachwatch Bute aims to do just that. Bute Community Links brings Third Sector organisations on the Isle of Bute together. This blog seeks to keep members of the community informed of our progress and activities.